Note: I highly recommend using studio monitors or Quality stereo headphones for the sounds later in this article, at a comfortable listening volume of course. I was asked by the Ottawa band Paragon Cause to write this article on hearing loss in musicians. I work in the field of Otolaryngology – Head and Neck Surgery. We do surgery, but we also treat hearing loss. I see it all the time, a musician comes to see me for tinnitus (ringing in the ear). The first step is to do a hearing test and often we will find hearing loss in people with tinnitus. In these cases, it is usually permanent, devastating and sadly, 100% preventable. The goal of this article is to help musicians understand what happens with hearing loss, and why it is so important to protect your ears when playing music. Whether you are a sound engineer, a mixing engineer, a producer or mastering engineer, having good ears is critical. If you do have some hearing loss, understanding what frequencies are affected are also critical. In the world of music, nothing is more precious than our ears. I have a bit of a passion for hearing and hearing protection as I have witnessed many musicians realize it when it is too late to do anything. Once your hearing goes, it goes, there is no turning back. The only way we can fix it, is to prevent it. Although hearing aids are effective, in the world of music, there is nothing better than our ears. You may have read about many musicians who can no longer play due to hearing loss. Eric Clapton, Will.i.am, Neil Young, Ozzy Osboure, James Hetfield, Liam Gallagher, Mick Fleetwood, and a ton of others. Phil Collins is another (can’t leave him out). For each decibel level, you can see the MAXIMUM amount of time someone can be exposed to the sound level without damage. What is considered loud? In Canada, workers are allowed to be exposed to 85dB for 8 hours maximum. Anything above 85dB and the amount of time you can be exposed decreases or you risk damage. 85dB of sound exposure longer than 4 hours a day is a problem. How loud is that? The same as a busy city street. Many of us are probably exposed to something near that level. The pain threshold for sound is about 125dB while the average rock concert is 115dB. That should tell you something. A rock concert is close to the point that triggers pain! A bit more context, that level of sound is 10dB below heavy construction work. Here is the important stat, 15 minutes of 115dB sound is the amount of time before damage occurs. That’s right, just 15 minutes. Remember, your ears don’t know the difference between noise and music, if its loud, its loud. If you go to a concert, even at a small club, odds are you are over 100dB and it’s a potential problem, especially if you do this weekly. A few things to discuss before I delve into hearing loss in musicians. When Audiologists perform an audiogram (hearing test), they do not test all available frequencies in the human ear. The primary frequencies they are concerned with are those important for speech. This usually involves testing 125 Hz to about 8000Hz. Those of us who record and mix music, know that this isn’t all the important frequencies in music. Due to this, even if you have a ‘normal’ audiogram, doesn’t mean you don’t have some hearing loss in frequencies above 8-10 kHz. There are two types of hearing loss, sensineural and conductive. Sensineural means it is damage to something within the organ of hearing (Cochlea), the nerve of hearing or the brain. Often, it is permanent. This is the type of hearing loss that occurs when people get older and from noise exposure. The second type, is conductive. This is due to something like, wax in the ear, an infection or a ruptured ear drums. Some diseases cause this as well, but beyond the scope of this. One other important thing to discuss, is something all musicians and all concert goers have experienced, “Temporary threshold shift.” This is basically, temporary hearing loss. Its often due to some subtle damage to the organ of hearing that needs some time to repair. It often takes anywhere from 2-16 hours to return to normal. It often occurs after a long period of loud noise of brief extremely loud noise. This is usually not permanent, but tells you that your ears were exposed to a dangerous level of sound. You probably have noticed this before, that feeling of sounds being dull after leaving a concert. Its usually do to some mild damage to your ears or your ears trying to protect themselves from the loud noise. Noise induced hearing loss (the type musicians get) is the second most common cause of hearing loss, after aging. In adults, it accounts for about 16% of hearing loss. 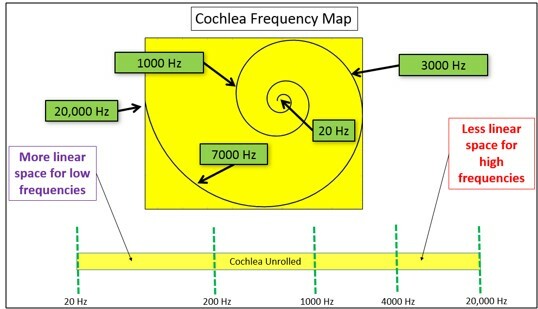 What happens, regardless what the noise is due to (welding, drum kits, etc), is that the noise causes stress on the organ of hearing (hair cells in the cochlea) which then leaves them unable to function. This causes hearing loss. Tinnitus, the perception of sound without any external stimulus, occurs in about 10-30% of the adult population. In those people with Noise Induced Hearing Loss (ie musicians) tinnitus occurs in 50-75% of them. In fact, the most common cause of tinnitus, is hearing loss. If you have tinnitus, you need to get your hearing checked. Another common finding in musicians, is Hyperacusis. This is a reduced tolerance to sound of normal intensity. This means, if you hear a sound that most people perceive as a normal intensity, it may be painful or unpleasant to a person with hyperacusis. How many Musicians Get Hearing Loss? There was a study published in 2018 (Int J Environ Res Public Heath, 15, 2120) that assessed all studies that studied hearing loss in musicians, this is called a “Meta-analysis.” The study included 41 total studies after weeding out bad ones. 21% of the studies looked at pop/rock musicians while 78% were classical musicians. In total, 4507 musicians were studied. When you compare Pop/rock to Classical musicians, 63% of pop/rock musicians had some level of hearing loss compared to 33% of classical musicians. The most COMMON frequency affected by the hearing loss was 6000Hz. Noise induced hearing loss results in hearing loss that is centered around 4000 – 6000 Hz. Think of it like the Q in a EQ curve (see Images later). About half of the people with hearing loss had hearing loss in only 1 ear, while the other half had it in both ears. When checking for tinnitus, 26.3% of musicians had tinnitus. What does this all say? Well, for one, if you are a rock musician, you have a higher risk of hearing loss than a classical musician, so protect your ears. What Frequencies are Affected in Musicians with Noise Induced Hearing Loss? Why does it affect 4-6 kHz the most? One reason, is that the resonance frequency of the middle ear/bones is about 4kHz, therefore that sound resonates and transmits, think about it almost like the resonance on an eq curve. Also, its thought that the cells in the organ of hearing around those frequencies, are more susceptible to damage. The organ of hearing looks like a seashell, but if you stretch it out, its basically like a ribbon microphone but organized topographically. The highest frequencies (short wave-lengths) are perceived at the beginning of the organ while longer wavelengths are perceived further down. How does Hearing Loss Affect a Musician? So, how does it sound to a musician when they develop hearing loss from noise exposure? What happens with hearing loss and how does this affect musicians? I’ve created some examples bellow, first using pink nose, then an actual song in stereo. What I’ve done, is take the pink noise and apply different levels of equalization to mimic the effects of hearing loss. 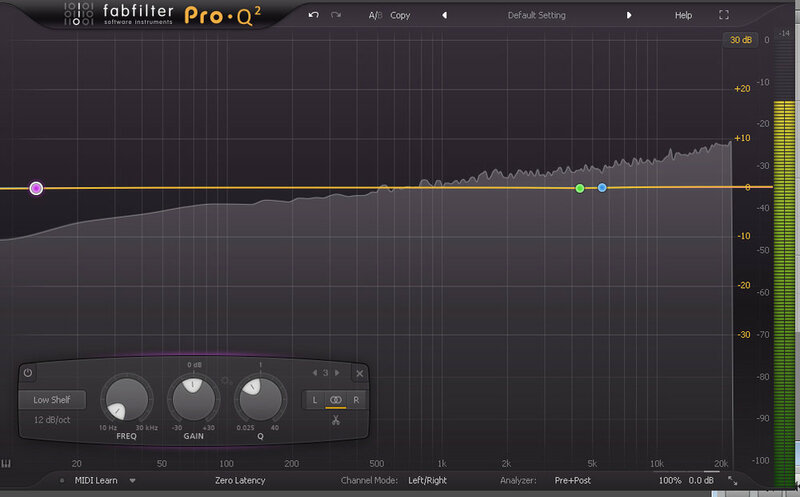 I used Fabfilter pro-Q 3 to do this, a fantastic EQ program. I used pink noise, since it is more commonly seen in biological systems. Image 1 is the eq curve of the pink noise, so you can see what it looks and sounds like when coming out of a pair of stereo monitors. After this, I then performed a reduction in dB centered around 4kHz of different levels to stimulate mild, moderate, moderate-severe, severe and profound noise induced hearing loss. You will be able to really hear the differences and see what you are missing in music with this. If you don’t hear a difference on headphones or good speakers, GET YOUR HEARING CHECKED as you may already have some hearing loss. Image 1 - Pink Noise in Fabfilter Pro-Q2. This is what pink noise looks like, notice its pretty even across all frequencies (for the most part). Take a listen below. Mild Noise Induced Hearing loss and Pink Noise - What does it sound like? Image 2 - Pink noise with a subtle EQ cut centered around 4kHz. This is what would happen if you had mild noise induced hearing loss in both ears. Take a listen and compare the sounds. Listen closely to the pink noise between the normal pink noise and the pink noise with a mild reduction in sound at 4kHz Can you hear the change? This is what it would sound like with mild noise induced hearing loss in a musician. Now take a listen to a deeper cut in the eq, corresponding to a moderate loss of hearing around 4kHz. Can you hear the difference now? Imagine what this hearing loss does when you try to hear certain instruments, particularly voice? We will get to that later. This is now a deeper cut around 4kHz, corresponding to severe hearing loss. You can really start to hear the changes and I am sure you can imagine how difficult it would be to mix/master if you didn’t know this was present. At this point, you can really hear the changes. Remember, 4kHz is the ‘presence’ of sound and is very important with vocals. I you had t his much hearing loss from noise exposure it would be very difficult to appreciate the vocals and music will sound very dull. When people age you loose hearing in the high frequencies and over time it starts to affect lower frequencies. If you already have noise induced hearing loss, as a musician this can be very difficult. Without a hearing aid, music appreciation and enjoyment are significantly affected. You can see the did at 4kHz as well as the high cut, corresponding to age related hearing loss. Often, people who have noise induced hearing loss have hearing loss worse in one ear. Here is a real life example of the Paragon Cause song Sunny. I’ve included a few examples. I chose this song as there is a good balance of frequencies across all ranges and lots of high end noise. 2. The next example, you will hear Mild noise induced (4kHz) Hearing loss in one ear (the Right Ear). Listen how the stereo field changes, you hear the voice move from the center to the side speaker (left) as the presence of the vocals are reduced in the right speaker. It is subtle, but there. 4. The next example is if you had noise induced hearing loss in both ears. Now you should really hear the difference. Things sound dull, lifeless and without any presence in the vocals. 5. Finally, you will hear what it sounds like when you have noise induced hearing loss in one ear and Age related hearing loss in the higher frequencies in BOTH ears. So, this is basically age related hearing loss in both ears and a 4kHz cut in the right ear on top of it. It is significant and the music is very dull. In this image, the green line is the Right Channel and I put a 4kHz cut only in the right similar to a noise induced hearing loss in only the right ear. The white line is affecting both ears, corresponding to age related high frequency loss in both ears. The key when listening to these, is the stereo field, particularly in the more mild hearing loss. As you reduce the ‘presence’ or frequency in one ear, the vocals seem to move from the center of the stereo field to the better ear. It’s subtle, but you can hear it and feel the music change. The reason is, you still have one ear that works perfectly, so your brain tries to fill in the details, but can’t so the stereo field changes. Listen closely, especially to the vocals. Although subtle, this is critical if you are a musician or someone that mixes/masters music. When you get to the last example, you will hear a big change as the hearing loss is in both ears. As a Thank You for this detailed article, please take the time to Follow Paragon Cause on Spotify or another service noted above, its very helpful. Huge thank you! Listen to Sunny and More of Paragon Cause at Spotify, Bandcamp, iTunes and all other streaming services. Hopefully by now you see how small changes in hearing loss can have a significant impact on hearing and music appreciation. Just remember, early onset or noise exposure related hearing loss can be prevented if you use hearing protection. I have helped Paragon Cause choose some high quality ear plugs that can be used for live shows and help prevent hearing loss. Whether you are a fan of music or a musician, protect your ears, once its gone, its gone.